Haggis Rampant and Frieman the Minstrel leading the queen and her court to the main gate. At the third annual Mid-South Renaissance Faire, we are fortunate in having excellent musicians. Haggis Rampant is not only one of my favorite RenFaire bands, but they include two of my three favorite pipers, Steve and Gillian Brownlee. (The third is Eric Rigler of Bad Haggis.) Naturally, with a name like Susan Murrie Macdonald, a member of Clan Murray by birth and Clan Donald by marriage, it’s no surprise I like the bagpipes. Who are Haggis Rampant? They’re a bagpipe and bodhrán trio. They’re a family playing together. They’re music with an attitude. And Heaven have mercy, are they loud! Normally, Haggis Rampant is a trio consisting of father Steve Brownlee and daughter Gillian Brownlee on the bagpipes and mother Pam Brownlee on the drums, both bodhrán and big bass drum. Daughter Morgan Brownlee sometimes accompanies them; Morgan is a dancer, a drummer, and a fiddler. They’ve been at the Louisiana Renaissance Festival since 2000, and at the Mid-South Renaissance Faire since 2015. They have CDs for sale if you want to hear their music, and appear in the ABC book R is for Renaissance Faire if you want a pictorial souvenir. They also perform at Highland Games, Celtic festivals, music competitions, weddings, funerals, boat christenings, inaugurations, etc. They did an impromptu performance at the Parthenon in Nashville, TN after the eclipse., which led the crowd of eclipse-watchers into spontaneous dancing. Morgan, Pam, and Gillian Brownlee at the second annual Mid-South Renaissance Faire. Steve Brownlee, an award winning piper, has been playing bagpipes since 1996. He has a wicked sense of humor, such as playing “Scotland the Brave” as he pipes the actress playing Queen Elizabeth of England to the front gate of the RenFaire, or playing “Rain, Rain, Go Away” during a shower. (I’ve never heard that song on the bagpipes before, and I probably never will again.) Pam Brownlee is an award winning bass drummer, who took up playing the bodhrán because accompanying Steve was the easiest way to spend time with her husband. Gillian Brownlee has been a piper since 2003, when she was only a “wee beastie.” She plays the fiddle as well as the Great Highland Bagpipe, although her competition victories have been as a piper, not a fiddler. Morgan Brownlee plays bodhrán, tenor drum, and violin, as well as dancing. She’s won a competition or two herself for her solo drumming. (What can I say? They’re a family of overachievers, with talent to spare.) Their shows include joking and teasing between the family members as well as great music. Most of their music is traditional, but they do a bit of contemporary now and again. Their first album, Haggis Rampant (hard to find, may be out of print), is traditional, as is their third album, Trì. Their second album, Wee Beastie, includes some of Steve’s own compositions as well as traditional Celtic music. Their fourth album, The Silver Glens, is what they call their “quiet album” (or as quiet as a bagpipe CD can be). “This album is a different mix for us. We’re usually playing music that makes our audiences want to jump up and shout “Freedom!” This time, to heck with creating energy; we wanted to record the music that stirs our souls.” Their fifth album, Burly!, includes Ken Petrie on the electric guitar and bass for a wild musical extravaganza. Their sixth album is still in the planning stages, and they’ve not yet announced the theme of it. If you’re lucky enough be to able to catch one of their performances, by all means do so. If you live too far away to be able to hear them in person, check out their CDs. Remember, they’re the letter R in my alphabet book R is for Renaissance Faire, autographed copies available for sale at the Mid-South Renaissance Faire, unautographed copies available through Amazon. Susan Murrie Macdonald with R IS FOR RENAISSANCE FAIRE. June 17, 2017, the Celtic Society of West Tennessee and the Jackson Area Music Society are presenting the Summer Solstice Music Festival in Parkers Crossroads, TN. The music festival will go from 11:00 am to 10:00 pm in the city park in Parkers Crossroads (roughly a mile north of the McDonald’s). There will be a wide variety of music: blues, bluegrass, gospel, rock, Celtic, and folk. The park has a very nice playground where the youngsters can burn off some energy. There will be vendors: Michelle Autry selling Limelight by Alcone makeup and skin care, Linda Piper with Perfectly Posh, Natalie’s Kitchen, Highland Heather Travel (my husband) answering your vacation planning questions, and me, selling R is for Renaissance Faire and Alternative Truths. One of the food vendors will be selling Irn Bru, a Scottish soda pop which is frankly something of an acquired taste, but one of my husband’s favorite beverages. There will also be arts and crafts, t-shirts, and CDs for sale. So head down Hwy. 40, turn north at Exit 108, and come to the Summer Solstice Music Festival in historic Parkers Crossroads, TN. The Browne Sisters are one of my favorite Celtic music groups, and I was reminded of them the other day by a Celtic Thunder video. This is odd, because normally it’s Celtic Woman who reminds me of the Browne Sisters. 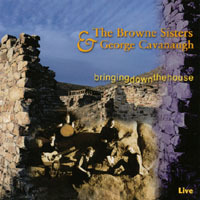 Technically the name of the band is the Browne Sisters and George Cavanaugh, as it consists of sisters Diane Browne, Pamela Browne Logan, Laura Browne-Sorenson, and their cousin, George Cavanaugh. The other day on Facebook, I saw a video of Emmet Cahill of Celtic Thunder performing the popular folk song “Spanish Lady.” He did an excellent job, as did the woman dancing with him. The set was beautiful. The musicians were superb. What surprised me was that Celtic Thunder asked on their Facebook page “Here is a fun song for you, anyone heard this one before? ?” I was even more surprised when several people said it was new to them, or that they had only learned it from Celtic Thunder’s sister-group, Celtic Woman. Alex Beaton has performed it. The Dubliners have performed it. So have the Irish Rovers, Johnny McEvoy, the Kilkennys, the Irish Tenors, the Whistlin’ Donkeys, and too many other musicians to count. My personal favorite rendition is by George Cavanaugh and his three cousins, Diane, Pam, and Laura. It’s on their album Ready for the Storm. The song itself is roughly 300 years old. Mind you, Emmet Cahill’s version is now my second favorite. 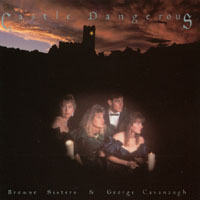 Once when we were in the car, playing Castle Dangerous on CD, my daughter said that they sounded like Celtic Woman. I pointed out that since the Browne Sisters have been performing longer than Celtic Woman has, no, Celtic Woman sounded like them. The first time I heard the Browne Sisters in person was at the Orange County Highland Games, in Costa Mesa, CA. My husband and I were still dating then, and we’ve been married more than twenty years, so we’ve been fans of the Browne Sisters and George Cavanaugh for quite a while now. They sing a mixture of Irish and Scottish folk songs, mostly traditional, some contemporary. They sing a few songs in Gaelic. When I last saw them perform in person, they said they learned the Gaelic songs phonetically, but it’s been a while. For all I know they’ve learned to speak Gaelic since then. 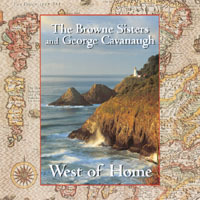 The Browne Sisters and George Cavanaugh would be very happy if you bought any of their albums. They’re available through CD Baby or at any good Highland Games. I would be very happy if you bought any of my books or stories. Photo from the Browne Sisters and George Cavanaugh’s webpage; used with their kind permission. Tapadh leibh!